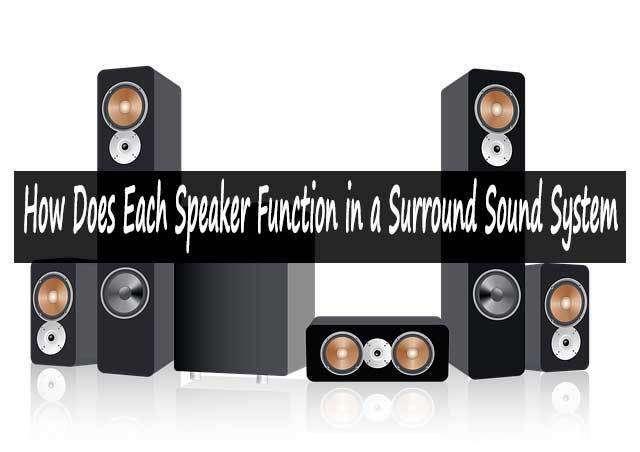 How Does Each Speaker Function in a Surround Sound System? →How Does Each Speaker Function in a Surround Sound System? Home entertainment is not complete without a decent sound system. In fact, when it comes to digital entertainment, movies, games and music, sound plays an even more significant role than visuals. The most popular sound systems today are surround sound systems. What does it mean to have a surround system? Well, the idea is to have an immersive sound experience nearly mimicking natural sound from all directions. Hence the name surround sound system. Surround sound systems were made for movie theaters in the early days of film exhibitions. Filmmakers were able to create lively and immersive sound with high fidelity and not necessarily loud using surround sound technology. Over the recent years, with the new age of home entertainment, surround sound systems have quickly caught on in domestic applications. The surround system technology is non-proprietary apart from unique standards such as Sony’s DTS and Dolby Atmos. In the early days, audio formats used were in two channels only, known as a stereo system. This meant you just needed two speakers (left and right) to realize the audio fully. Later came the AC3 sound format also known as 3-channel or 2.1, commonly used even now in CD tracks. The AC3 added a third channel for deep, low-frequency sound only connected to a sub-woofer. From the AC3, things escalated to the now popular 5.1, and 7.1 audio formats. Other formats such as 9.2 and, 11.2 are also available, though exclusive for professional use, movie theaters, and home cinemas. In simple terms surround system technology splits the audio codec into multiple independent channels. Every channel is fed into a different speaker with a specific range of frequencies. These speakers can then be arranged around an audience to provide a surround sound experience. These channels have to be broadcast spontaneously to consolidate into a full audio track. The most common surround system used in home entertainment content such as Blu-Ray films and video games is 7.1 (8 channel), which can be down-scaled to 5.1 (6 channel). The representation 5.1 means five separate channels for five different surround speakers. The (.1) part of the description means one sub-woofer channel. Making six the total number of audio channels. Both formats comprise of four main categories of speakers. These are; front speakers, center speakers, rear speakers and the sub-woofer. Let’s take a look at each of these speakers in detail. The sub-woofer is the most massive speaker in the system. It is enclosed in a large cabinet usually made of wood with large ventilation vents. The sub-woofer is used for deep, low-frequency sound signals. The low-frequency signals are responsible for the bass on audio tracks. The sub-woofer’s channel is exclusively filtered for bass only. Due to its design, it is incapable of producing high-frequency sound. In any sound system, the sub-woofer is most noticeable since it produces high energy vibrating sound. Some surround systems have a woofer in place of a sub-woofer. This is even bigger than a sub-woofer with a diameter of up to 30 inches. The problem with woofers is that they produce more physical vibration than sound. These vibrations can make items topple over everywhere in the living room, which is why they are meant for use outdoors and in concerts. At the front, we have the left and right front speakers. In most cases, these speakers are slightly larger than the other satellite speakers. They are full range, meaning they produce sound anywhere between mid-range and high-frequency sound. In surround sound media content, front speakers produce sound coming from the foreground of the picture. In relation to the left and right-hand side of the audience. Front speakers are also where the music soundtrack of a video game or movie is played. In modern home surround systems, most manufacturers are replacing the front and center speakers with a soundbar. A sound bar is a horizontal speaker array with multiple speakers arranged in a way to function as the front and center speakers. There are various types of speakers that you can use when it comes to the front left and right speakers. You can choose from bookshelf, or floor standing. It really doesn't matter which ones you go with, but what does matter is that they both work well together with the center speaker. In a 5.1 arrangement, the center speaker is only one and is placed directly overhead of the audience. In a 7.1 system, the center speakers are a pair positioned beside the audience on either side. Center speakers are not as large as the front or rear speakers. They are full range and usually tuned to a lower frequency than the front speakers. In media such as movies and games, monologues, narrations and most conversation are channeled to the center speakers. Rear surround speakers are a pair of surround left and surround right speakers. About the same size as the front speakers or smaller. Like the front speakers, they correspond to the right, and left-hand side of the audience and are set just behind the audience. They can produce a full range of frequency and are tunes to a higher amplitude than center speakers. Background sound and most special effects are channeled to the rear surround speakers. Like mentioned earlier, there’re surround sound systems with more than eight channels. Audio channels can go to as high as 13. However, the basic layout of the surround speakers is the same. You will always have the front surround, center, sub-woofer and rear surround. What might change is the number of speakers and channels representing each of the distinct categories. For instance, there can be two sub-woofers in a 9.2 surround system, and four channels for the front surround, one center surround, and four speakers in the rear. The more channels used, the more the surround effect becomes vivid and pronounced. While it may not seem very important, it's actually very useful for you to know the function of each speaker in your home theater system so that you can position them the right way. Use this article as your resource to help you choose the types of speakers you want and put together a system that will be better suited for your needs.